Whenever I tell people that I’m a paranormal investigator, initial responses vary between, “Ohmygosh! Can I go with you on an investigation?! ?” and “Wow. Yeah. All the nopes.” People are always a mix of curious and terrified and I want my book, Memoirs of a Future Ghost to be bridge between those two emotions. I wanted to show the curious people how amazing it is to do this and also demonstrate to those who are frightened that hunting ghosts isn’t always scary. Sometimes? It’s downright comical. I have a little gift for all of you today, thanks to my husband Tyler. He mentioned, “Hey! 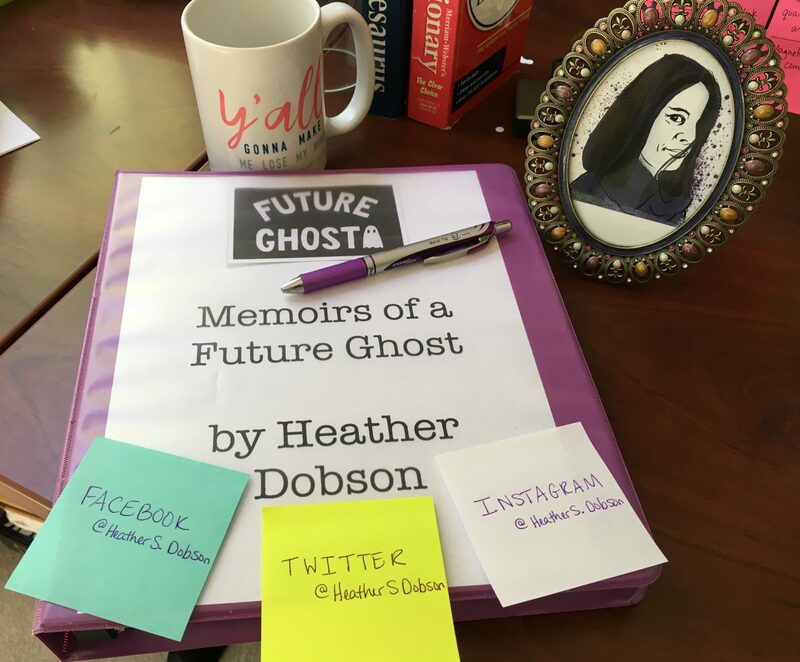 You should totally put an excerpt of your book up on your web site!” I hemmed and hawed and finally decided, “Why not?” So, I present to you “The Reality of Hunting Ghosts” – one of the many chapters in my book. It’s gone through a self-edit and a grammatical edit, but believe me when I say that my book is going through MAJOR content edits. This chapter will probably look completely different when it’s all said and done and you may not recognize this chapter when you finally have my tome in your paws. But, until then, enjoy this light-hearted look into what it’s REALLY like investigating the paranormal! I’m sure you can picture this. Gary Ghosthunter with his perfectly-themed bad-boy tattoos is in his crisply-ironed black pants and Ed Hardy shirt. He swaggers into the latest historical site, found by his production team and paid for by a TV channel. He acts like he owns the paranormal activity occurring there. His television production crew sets up his Hollywood-funded equipment while his black-clad co-stars munch on craft services that serves food tailored to their dietary specifications. Over the course of several days, they have complete access to the location. They are handed the historical documents and information by a hard-working, little-recognized production crew. Witnesses come out of the woodwork to tell their stories of paranormal experiences because they might be on TV. During the several nights of investigations, Gary and his crew dramatically react to whatever shadow they see and noise they hear. They’re convinced that it’s a dark spirit and that they now have a demonic attachment. Muscles bulging, voice straining, Gary fiercely calls out whatever is there and tells it to go away and leave them alone. After all is said and done, the television production crew pours through the audio and video collected over, probably, four nights of investigations and they “capture” a class A EVP or a shadow figure on film. All of this is condensed down into a 42-minute show with the best reactions, the best stories, and the most compelling moments put forth for your viewing pleasure. In real life, paranormal investigations are quite different. It’s 3:30 PM on a Saturday and I’m getting ready to meet my team for dinner. The location is two hours away and we’re carpooling, so I need to leave NOW to get there in time. I’m rushing around the house lint-rolling my team shirt because it’s covered in cat fur. I can’t find my flashlights because the kids got into my investigation kit and played with them. They even raided my stash of AAA batteries. I can’t even get out the door because I’m dealing with parental guilt because the kids have all whined, “BUT WHY DO YOU HAVE TO GO, MAMA?!?! ?” and made me feel like the recipient of the “Worst Mom of the Year” trophy. I finally make it to my fellow investigator’s home and we all pile into one car for the two-hour drive to a restaurant near the client’s location. We talk, laugh, discuss the case, and catch up on our lives. When we’re done eating at the restaurant (which is probably going to give my intestines a run for their money) in this random small town in Georgia, we load back up and trek to the client’s home. Once there, we find that the house should probably be on an episode of Hoarders and the client should probably be on Dr. Phil. But, hey, we’re here. So, we do a walk-through of the house, have the client sign some paperwork, and set up our self-funded equipment. During the investigation, we’re dealing with a dog in the back yard that is howling and a cat that keeps setting off our REM pod. There is dust everywhere and when we’re not sneezing, we’re trying not to sit in any cat pee because woo-doggies can we smell it. Meanwhile, my stomach is NOT happy about that burrito I had for dinner and while I might not be experiencing paranormal activity, my intestines make it sound like the house has 12 demons infesting it. In between EVP sessions, we hang out in the car, sucking down cheap coffee and local bodega honeybuns to try stay awake. Four hours later, we pack up and call it a night. We will most likely never step foot in the client’s house again because most investigations are one-off gigs. The two-hour drive back home is quiet, except for intermittent, “I SMELL CAT PEE!! !” exclamations from around the car. When I finally make it home, it’s nearly 3:00 A.M., I throw my cat-pee soaked jeans in the washer, and stumble into bed. Two days later, I admit to myself that I need to listen to my recordings for audio evidence. I do so unshowered and in my wrinkled PJs, finally realizing I’ve captured exactly NO EVPs (except that one stomach rumble which would have made an AWESOME demonic growl and, yeah, Shawn needs to stop farting). A week later, I finish watching four hours of video footage from the client’s master bedroom. I’ve had to watch it in 20-minute increments because it’s so boring that any longer than that would make me want to weep and curse and cry. The only thing the footage showed is that, yes, that’s one dusty house and, no, that movement wasn’t a ghost but it WAS a raccoon at the bedroom window. When we finally turn in our final report with no audio or video evidence and one personal experience involving a cobweb and an air vent, the clients are in no way appreciative because documented paranormal activity would have either A) Made them feel special because they love Ghost Adventures and they hoped having documented paranormal activity could pave their way to a guest spot on a paranormal TV show spot or B) Convinced them they aren’t crazy. Two weeks later, we have a group meeting where we catch up on all our investigations, who has to still watch video footage, who is writing the final report, which clients are lined up for investigations, and who is calling which of them. We all speculate how nice it would be to investigate a clean house in the “Country Club of the South” community. Instead, it looks like we’ve got a 20-year-old single-wide near the Alabama boarder on tap for the end of the month. Two IR cameras are on the fritz, so we take up a collection for new ones. I remind everyone to make sure when they write a blog post for our website, they add all the “tags” to each post because we have no advertising budget and search engine optimization is the only way to get our site to show up early on the search engine lists. We discuss recording a podcast, trying to wrangle a date and time that’s good for everyone. We grumble that our operating budget is well below $200 a year and wonder how we can get a FLIR camera donated to us. We then remember that’s a fantasy, say our good-byes, and start the process all over again. AND WE DO IT ALL FOR FREE, with no TV production crew in tow. That is what it’s like investigating the paranormal in the real world! Make sure you leave a comment below and tell me what you think! And thanks for reading!